In 1984 or 1985, Don Hopkins (a very imaginative fellow) mailed me a letter. On the envelope he had written several amusing sayings, including this one: “Copyleft—all rights reversed.” I used the word “copyleft” to name the distribution concept I was developing at the time. I got the "Copyleft (L)" sticker from the dealer's room at an East Coast Science Fiction Convention, a roving eclectic community gathering that both Richard and I frequented. Fortunately, I made a photocopy of the envelope before I mailed it, which I eventually rediscovered and scanned. Richard and I were friends thanks to the fact that I was fortunate enough to have a "tourist" account on the MIT AI Lab's PDP-10 systems, which ran ITS, the Incompatible Timesharing System, the original version of Emacs written in TECO, the AI programming language MACLISP, the computer algebreic system MACSYMA, and the interactive fiction computer game ZORK. At the time, the MIT AI Lab had a wise and generous "tourist" policy, of giving out free guest accounts to anyone who expressed an interest in using their computers to learn about AI, programming and Lisp. I owe much of my success, and my love of programming Lisp, Emacs, and free software, to the MIT AI Lab's tourist policy and the people who sponsored it. Tourists from all over the world would log in during non-business hours (usually over the ARPANET, which at the time had no passwords), to learn, socialize and help each other, and lab members would sponsor and guide them, to keep them out of trouble. Only the most self-entitled, obnoxious and destructive tourists were flushed. ITS was a very open system with no file protection, so you could learn by reading anyone's files, and even use a program called "OS" (which stood for "Output Spy") to see what other people were doing by watching over their virtual shoulder. That kind of activity was considered socially acceptable, because everyone knew anyone else could read their files and watch what they were doing, and it was meant for collaboration, sharing and education. In many ways, thanks to its support for open communicaton and collaboration (and its pioneering distributed file system), ITS was the first "social network". That beneficial situation on the early ARPANET is in stark contrast to the current disasterous situation on the present Internet, where the NSA and their ilk spy on everyone, while prohibiting anyone from knowing about it, without any meaningful oversight, for reasons having nothing to do with collaboration, sharing, education, or even "preventing terrorist", as they mendatiously claim. Even back then, Richard was already well known and respected as someone who promoted freedom and openness, to the extent that he didn't even use a password on his account, and was happy to let anyone log in as "RMS", and long as they did not abuse it. When the powers that be finally forced everyone to use passwords, he let everyone know his password was "RMS", so the term "RMS" evolved a verb that meant logging into a computer as user: RMS, password: RMS, as in "I RMS'ed into AI to play DOCTOR". "RMS" was much easier to type and spell than "Anonymous". People would even make "front door" RMS accounts on computers they wanted to let anyone log into, that the real RMS had never actually logged into himself, and didn't even know about. The ARPANET was certainly a lot different back then than the Internet is now. This is a scan of the "Copyleft (L)" sticker on the front of the envelope mailed from Don Hopkins to Richard Stallman on 1984. The envelope contained a 68000 manual that Don borrowed from Richard, that he was returning. The sticker inspired Richard to use the word "Copyleft" for licensing free software. 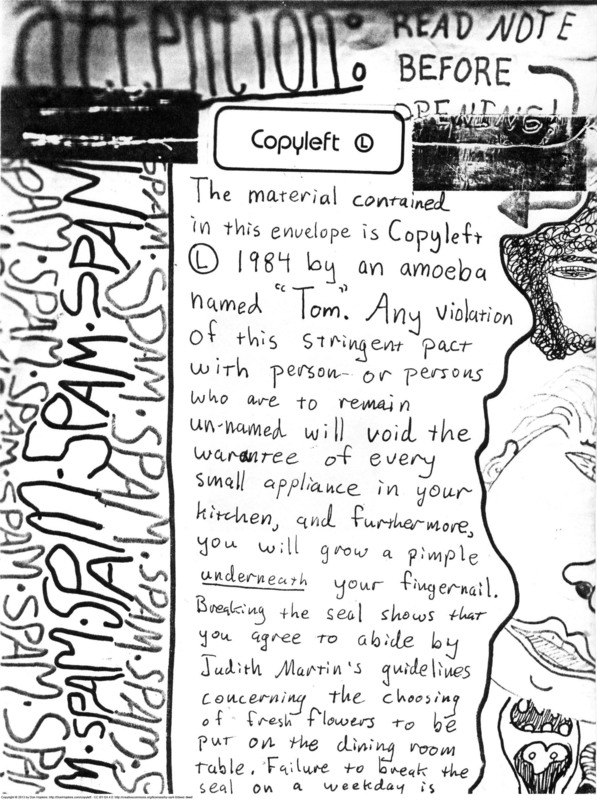 "Copyleft (L) sticker", from the envelope mailed from Don Hopkins to Richard Stallman in 1984 by Don Hopkins is licensed under a Creative Commons Attribution-ShareAlike 4.0 International License. 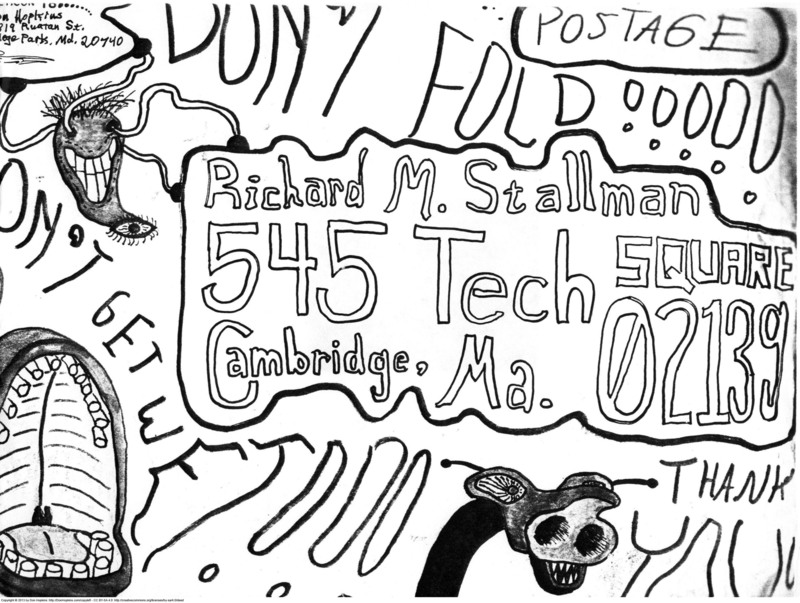 This is a scan of the front of the envelope with the "Copyleft (L)" sticker, mailed from Don Hopkins to Richard Stallman on 1984. The envelope contained a 68000 manual that Don borrowed from Richard, that he was returning. The sticker inspired Richard to use the word "Copyleft" for free software. Front of the envelope with the "Copyleft (L)" sticker, mailed from Don Hopkins to Richard Stallman in 1984 by Don Hopkins is licensed under a Creative Commons Attribution-ShareAlike 4.0 International License. This is a scan of the back of the envelope with the "Copyleft (L)" sticker, mailed from Don Hopkins to Richard Stallman on 1984. The envelope contained a 68000 manual that Don borrowed from Richard, that he was returning. The sticker inspired Richard to use the word "Copyleft" for free software. Back of the envelope with the "Copyleft (L)" sticker, mailed from Don Hopkins to Richard Stallman in 1984 by Don Hopkins is licensed under a Creative Commons Attribution-ShareAlike 4.0 International License.